Americans expect reliable and affordable energy, powered by a diverse mix of coal, natural gas, nuclear power, oil and renewable sources. Energy Fuels is a critical partner in keeping America’s energy mix diverse by providing fuel for the nation’s commercial nuclear fleet. Uranium, the only source of fuel for commercial nuclear power plants and the reactors that power our nuclear navy, remains a strategic resource for electricity and national defense. In the last 60 years uranium has become one of the world’s most important energy minerals. The United States has the world’s largest fleet of nuclear power plants. Our 99 commercial nuclear reactors, operating in 30 states, supply 20 percent of the nation’s electricity. However, despite once being the world’s largest producer of uranium, the U.S. now imports over 90 percent of the uranium needed to power our commercial nuclear power plants. 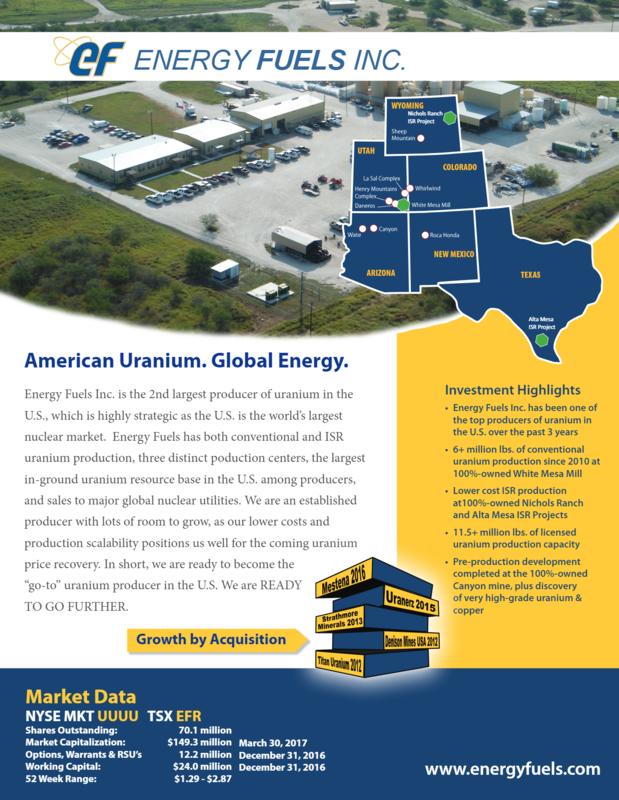 As one of the top producers of uranium in the U.S. over the past three years, Energy Fuels is the only conventional mill uranium producer in America. They own and operate facilities, including the White Mesa Mill in Utah and the Nichols Ranch ISR Project in Wyoming that produce 11.5 million pounds of uranium per year – and have the capability to scale-up those operations as needed. Energy Fuels has the resources and processing capacity to significantly increase uranium production in the U.S. Energy Fuels has both conventional (underground) and In Situ Recovery (ISR) uranium production, three distinct production centers, the largest in-ground uranium resource base in the U.S. among producers, and sales to major global nuclear utilities. ISR mining is a safe, proven method that accounts for about 50 percent of world uranium production. Modern techniques for ISR uranium make it a controlled, safe, and occupationally and environmentally sound method of uranium recovery that preclude any significant adverse impacts to workers, land or water, including underground sources of drinking water. With 56 nuclear plants under construction and another 511 proposed around the globe, there is an opportunity for the U.S. to increase uranium production for domestic use and to supply growing global demand.